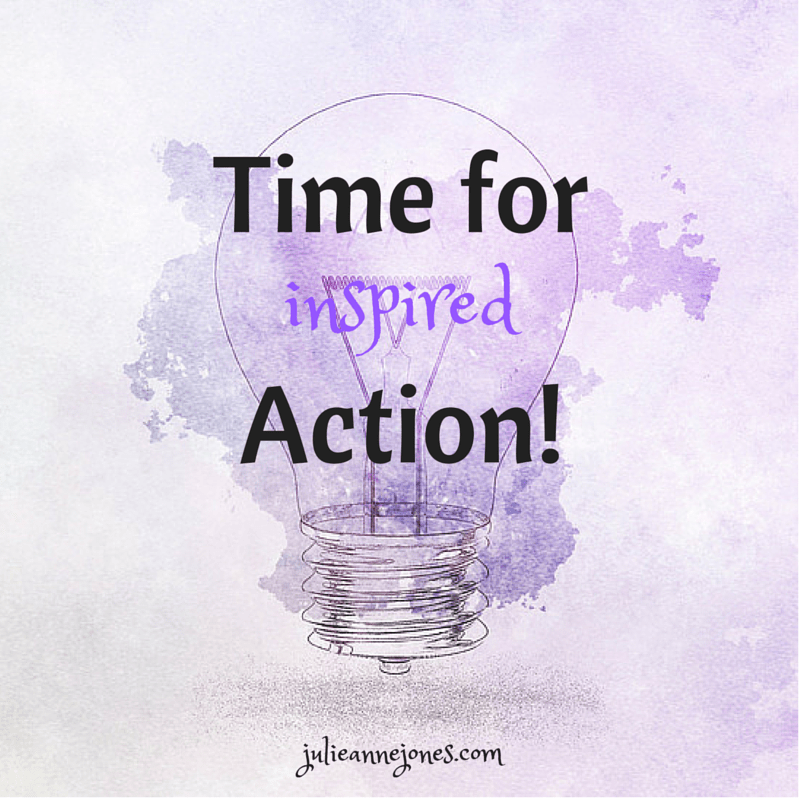 Last week I wrote a blog post about making a plan for 2016 and I shared 4 steps you can take now to make sure you step into 2016 with some action steps. In that post, I touched briefly at the end on the concept of making a plan and then being open to inspired action. I wanted to elaborate on that just a bit today. For the most part, I get my goals. I decide what I want, create a clear vision and plan, and then celebrate once I get it. The thing that I’ve noticed recently, however, is how often I look back once I’ve hit the mark and reached my goal and realize that the path I took to get there was completely different than the one I mapped out or expected. And often times, the path I’ve walked wasn’t even one I knew existed (or would have thought I had access to) when I set the goal. In fact, sometimes I make a plan without really knowing exactly how I’m going to execute it because I’ve learned that when a need arises for a piece of the puzzle that’s missing, it always show up, as if by magic. That’s where inspired action comes in. You have to be willing to listen to and act on your intuition, even when you’re not exactly sure where the action will take you, trusting that you’re being led by a power greater than you with more knowledge of the outcome. In other words, step out in faith and just do it if it feels inspired. I’ll give you an example. Several years ago, I had a very clear goal for creating an online virtual academy for direct sellers. I wanted to be able to create “classes” online with pre-recorded, short pieces of my material that students could access and learn at their own pace. I also wanted a way to work with them once they had assimilated the material, helping them to integrate that learning into their businesses. And I wanted to work with as many people as possible…in about eight hours a week. I had no idea if there was even a system out there that could do that, but I stared creating the material for the modules anyhow. A leap of faith. Then, in early December of that year, I got an e-mail from one of the online information marketers I follow about a coach from the UK who could teach me to coach multiple clients in about 5 hours a week. I’d actually seen the same promotion for the same free call at least two other times that year and completely ignored it. Although I’m an accredited life and business coach, I don’t really make my living coaching individual clients. I consider myself more of a trainer and mentor. So this call wasn’t for me, it was more for my coaching friends who needed that information (or so I thought). But as I read the e-mail that day, I got that unmistakeable intuitive tug that told me I needed to sign up for and attend the free call. So I followed it, not really seeing the point but knowing better than to argue (which has never served me. Whenever I choose to ignore my intuition, I pay a heavy price that generally leaves me feeling regret and frustration, at the very least). Long story short, the coach doing the free call’s name was Nicola Bird and the program she was selling on the call was an online coaching system called Jigsaw Box. It was exactly what I needed to create my very first virtual academy. I couldn’t have designed it more perfectly if I’d tried. The perfect system had literally fallen into my lap, and I would have missed it completely if I hadn’t taken the inspired action of signing up for that free call. That first academy supported over 250 students and changed their businesses. It has evolved into my Direct Sales Success Blueprint and my Leadership Accelerator Coaching Program and I still use Jigsawbox for that program. I also use it for several other programs that I’ve created since I found it. Ask and the answer appears, and in my experience, this one literally changed my business. So the next time that little voice inside you starts nudging you to drive a different way today or check out a seemingly unrelated video your friend forwards you from Youtube, or stop by your husband’s office unannounced for lunch, follow it. You just might find that the solution you’ve been looking for that can make all the difference in you getting what you want is somehow tied to that seemingly random act. Need some help and support in making your plan for 2016? There’s still time to join me me and hundreds of other enlightened direct sellers in my “Cracking The January Code Ultimate Planning Kit for 2016!” program. Our group booking blitz starts on Sunday and there are 3 video modules with specific action steps, learning, and worksheets as well as a very active private Facebook group of others to support you when you’re feeling challenged and cheer you on when you’re winning! Plus, I’m doing 3 LIVE webinars for MEMBERS ONLY to answer questions and give you one-on-0ne support as you make your plan. If you’re interested in joining us, you’ll need to hurry. I’m shutting down registration tomorrow. CLICK HERE to learn more. It’s a super low investment and I’ll show you exactly how to spend just a few hours between now and the end of the year and create a kickin’ plan for 2016!